Whenever you talk to millionaires and business owners, one of the things they always recommend as a way of attaining success is to read books. Books give you the power to learn new things and work through career slumps. In other words, books can take you to places you’ve never been and give you ideas you never thought of. And these days there are no excuses not to continuously read. I mean, you can listen to audio books while you work out, do chores, or when you’re on the road. Take some time this week to read a book or listen to a new author. Not only is it fun, but it will get your creative mind working. Get your spending and saving under control now. Debt is no fun at all and it is dragging you down. Until you’re debt free, your money is not truly yours. And don’t forget about stashing away cash so you can fund your dreams. My mom always said it’s so important to always have cash on hand. Saving enough money to pay cash for what you want will give you the ability to quit a job you despise, start a business you love, or simply have the financial freedom you want. 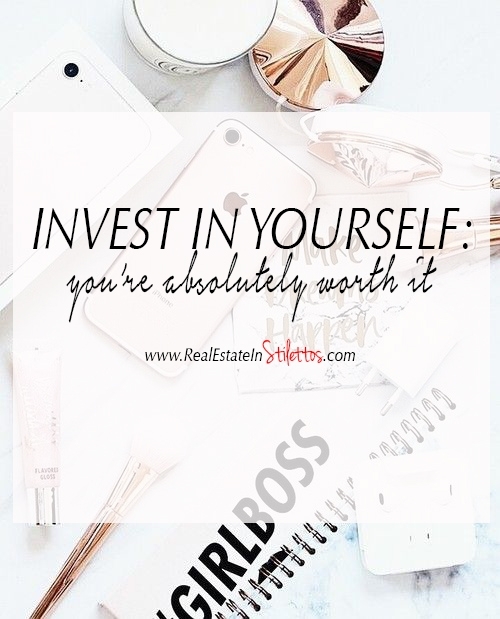 Having extra cash for both emergencies and possibilities is an amazing investment in yourself. For starters you can improve your financial profile by opening a tax-free saving account. Don’t wait until retirement age to start saving or investing. You need to start thinking about your future and how you’re going to afford the lifestyle you want. As business owners, we’re more tech-savvy and have access to awesome products and services that make our financial better. Take a moment to think…What’s a skill you’ve been dying to learn? What’s something in your biz that you’re frustrated with that you know could be better? You already know the importance of self-care but how often do you actually make time for this in your daily life? From taking a break to watch Netflix to simply enjoying a bubble bath, giving yourself a break is key to avoiding burnout. Give yourself permission to take a break and don’t feel guilty about doing so! Your path to investing in yourself doesn’t have to be a solo trip. Find yourself a business coach or mentor who can guide you when you get discouraged or feel lost. When you work for yourself, you need someone on your team who can figure out what’s working and what’s not, what’s valuable and what’s not. A business coach can be your biggest advocate. Most importantly, they will help you figure out how to make your dream business a reality. I know it’s difficult to part with your hard-earned cash, but a business coach may be the very best investment you can make. The basic insurance types everyone should have includes: life (for those with dependents), auto, homeowner’s/renters, and health insurance. With an ever-changing economy you need to have multiple income streams. We can no longer rely on a single job or income stream to pay our bills. If you want to earn passive income, creating multiple streams of revenue is vital to being financially stable. Having more control over your money means reducing the risk of a single revenue source and earning money from different avenues. Not only will this help you sleep better at night, but you might uncover a passion you have for something you never even realized. You must learn to say YES and NO to the right things and create boundaries within your life. And just because you say NO to something doesn’t make you a bad person. In fact, knowing your limits and respecting them is what will make you a great person! A side hustle isn’t necessarily about investing or saving small amounts of money. Earning money in your spare time often means developing a skill that you can offer as a service to clients. For example, you could learn how to become a freelance writer in just 30 days and start getting paying clients. And while this is true, sometimes it’s just as important to invest time into yourself. Learn how to strike the proper balance between investing time and investing money. In other words, be patient. Know when to splurge and when to save, or when to invest and when to let time do its thing.